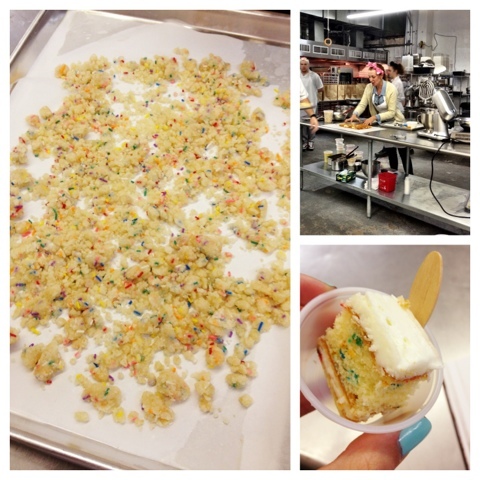 A few weeks ago, you may have read that Boyfriend and I spent the evening at Momofuku Milk bar making Crack pie and cereal milk. Well, BF went out of town for a business trip the other day and I went back to the bakery for more! And this time we were making crumbs. I was so excited to be able to make it to this particular class because I have had no luck making Milk bar cookies yet. I've made them twice before and I have come out with vastly different results. First, I made the blueberries and cream cookies and wound up with thin, crispy, non-delicious cookies. The second time, I made the compost cookies and wound up with high mounds of baked dough. I was determined to make this work! 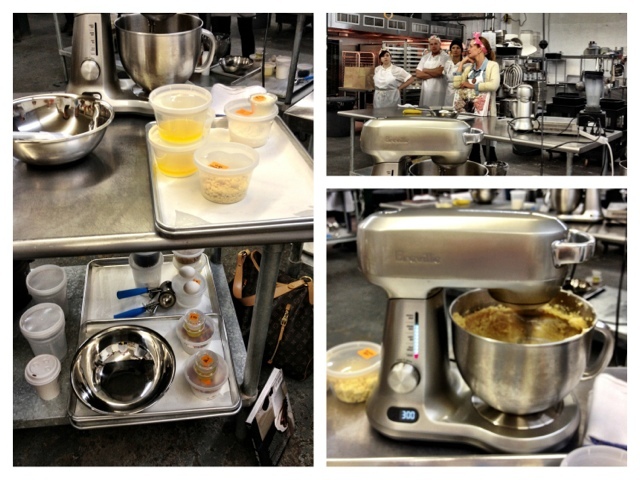 At the crumb class, Tosi and her team showed us how to take ordinary ingredients, like powdered skim milk, and turn them into tasty inclusions for our baked goods. 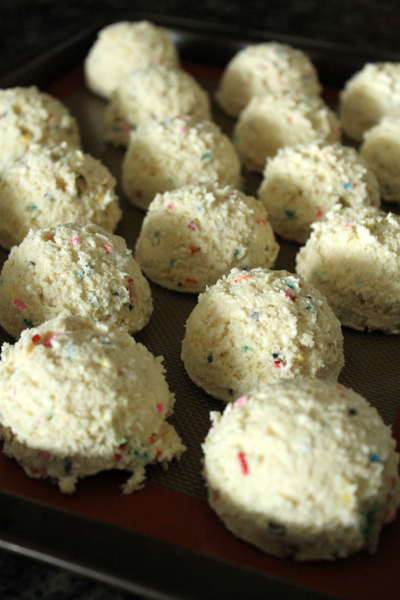 We made a white chocolate-coated milk crumb and a sprinkle-filled birthday cake crumb. The reason I signed up for the class though is what we did with the crumbs - we made cookies. Those blueberries and cream cookies that I originally had no luck with. Second try is the charm? I learned exactly what I ws doing wrong with the cookies. It was a series of problems. 1. I wasn't using the correct ingredients. 2. I wasn't beating the butter high enough or long enough. 3. I was mixing the flour into the cookies for too long. 4. I had the wrong size cookie dough scoop. After learning the correct tricks for each of these problems, you might be wondering if my blueberries and cream cookies came out all right. Well, my bakery partner and I ate them too fast and I completely forgot to take a picture. Yeah, they were perfect. Let me pass on the secrets. Let's start with the ingredients. I labeled you a nice picture above and hit on the key ingredients. Bread Flour - I used all-purpose flour the first time. Because of the higher percentage of butter in these cookies, you want a higher protein flour that can support all that fat. European butter - Tosi mentioned that regular unsalted butter would work fine, European butter is made with cultures and tastes richer. 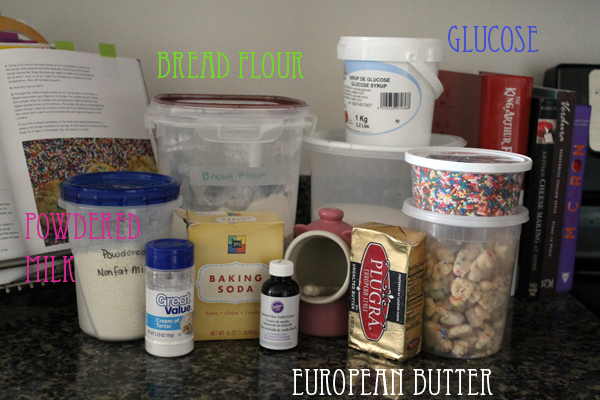 Glucose syrup - I originally used corn syrup, as the cookbook said it would be fine. I can say that the glucose lead to a crunchy/chewy cookie that was amazing. If you can find it, use glucose. Powdered milk - Okay, I did use this in the original recipe, but you might not know where to find it. I bought private label powdered skim milk and it works just fine. You will either find it in the baby or baking aisle. Once you have the proper ingredients at hand, it's all about timing. The Breville stand mixers that we used actually had a timer on the side of the machine. I totally wanted to take that mixer home with me, it was awesome. When combining the butter, sugar and eggs, you need to beat and beat until you see no more streaks of sugar crystals. In the first image above, you'll see exactly how far you have to take the mixture. It's just before the mixture turns into butter soup. We started with fridge temperature butter and in ten minutes, on the highest setting, it turned into that fluffy buttery cream. Adding the dry ingredients to the butter mixture is done quickly. After pouring all of the dry ingredients into the bowl, you turn on the mixer to medium low and mix for less than 30 seconds. 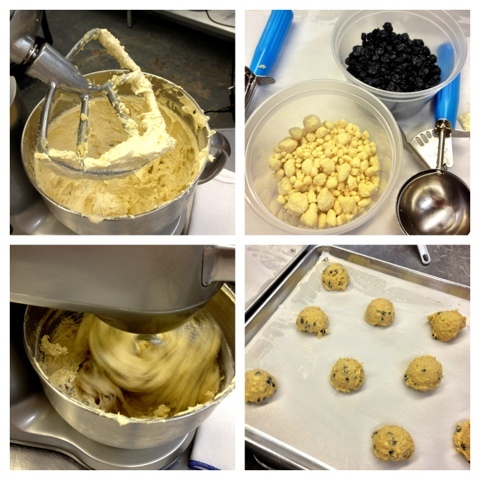 The final inclusions (crumbs, dried fruits, chocolate chips) are added and mixed in for less than 15 seconds. The final step is measuring out the dough. I went to Amazon and bought the same measuring scoop that they use at Milk bar. It's that blue handled cookie dough scoop you see resting on the baking sheet. By portioning out the cookie dough with this scoop, the cookies bake perfectly in 18 minutes. 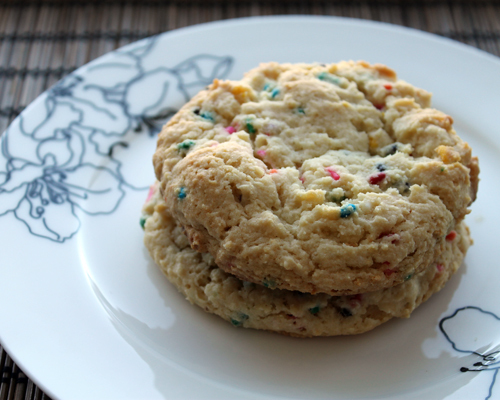 I spent a few hours with the Milk bar team and have finally mastered these amazing cookies. It's a combination of the high butter to flour ratio, addition of glucose and secret powdered milk ingredient, that make these cookies chewy, crunchy and amazing. They are also huge and a meal of their own. Hopefully my previous failures and newfound knowledge will help you when making the Milk Bar cookies! Let me know if you have any questions when baking, I learned quite a lot from the bakers at Milk! And of course, if you are coming to NYC sometime soon, sign up for a class yourself! It's a great way to spend a night! There are two steps to making these cookies. First, you have to make the birthday cake crumbs. Next, you make the cookies. I suppose you could omit the crumbs, but then you'll be missing the iconic, salty-sweet, Milk bar flavor combination. You'll also notice that I specify clear vanilla extract. This is the imitation vanilla extract that you can find at the craft store or online. We want the fake flavor, this is not the time for your good organic vanilla extract. Chop up room temperature butter into large pieces. Start that stand mixer on medium and begin breaking up the butter. Add sugar and glucose and cream on medium-high for 3 minutes. Scrape down the sides of the bowl and add eggs and vanilla. Turn up mixer to high and let beat for 7 to 8 minutes. You may need to scrape down the sides of the bowl a few times. You're going for a creamy butter with no trace of sugar crystal. In a small bowl, whisk together dry ingredients (except crumb). Add dry ingredients all at once to the whipped butter. Turn mixer on low and stir until everything just comes together, less than 1 minute. 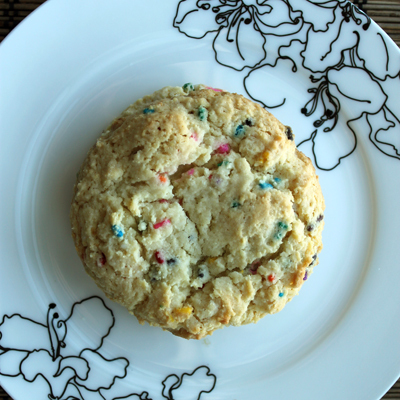 Add birthday cake crumbs and mix for about 15 seconds. Scoop cookie dough with a 2 3/4-ounce scoop or 1/3 cup measure. Place cookie dough lumps on a parchment or silpat-lined baking sheet. Pat down the tops of the domes just a bit. Once all of the dough has been scooped out, wrap up baking sheet with plastic wrap and place in the fridge. Let the dough chill for 1 hour minimum. Preheat oven to 350 F and line several baking sheets with parchment paper or silpats. Place 5-6 cookies on each baking sheet and bake for 18 minutes. The cookies will puff and crack and turn golden. Remove cookies from the oven and let cool completely on the baking sheet. The cookies will settle and set up as they cool. Cookies will keep for about a week at room temperature, if they last that long! Preheat the oven to 400 F and line a baking sheet with parchment paper or a silpat. In a large bowl, whisk together the dry ingredients. Add oil and vanilla and stir with a wooden spoon until the dry ingredients are coated in oil and they start to clump together. Spread clusters of crumb on the prepared baking sheet and bake for 20 minutes. Remove from the oven and break up any large clumps. Let them cool competely before using in the cookie recipe.